Is CBD or THC Better for Your Condition? While there are over 100 cannabinoids present in medical marijuana, THC (tetrahydrocannabinol) and CBD (cannabidiol) are the two most well-known and abundant. THC is the component that gets you ‘high’ and is classified as a schedule 1 drug by the DEA. CBD, on the other hand, can be found & legally purchased, even in most states where medical marijuana is not legal, since it produces no psychoactive effects. Both have their separate uses and we’ll go over their individual strengths and weaknesses. To understand better why one should be used over the other, it’s helpful to compare their chemical differences. Even though CBD doesn’t directly activate cannabinoid receptors, it still has wide-ranging effects. It helps to increase the number of natural cannabinoids that the body produces and changes how molecules interact with your receptors, often in very beneficial ways. For example, it seems to increase the effectiveness of opioids for pain-relief by directly acting on other receptors in your brain and body. By affecting dopamine and opioid receptors, CBD can also help relieve cravings and withdrawal symptoms associated with addictive medications. THC has a wide range of potential side effects, many of which can be beneficial depending on the condition being treated. These can include euphoria, increased appetite, relaxation, sedation, red eyes, decreased coordination, anxiety, paranoia, short-term memory impairment, and dry mouth. CBD, on the other hand, produces very few side effects, with patients rarely reporting dry mouth or upset stomach. It’s impossible to overdose on either cannabinoid, however, CBD at high doses upwards of 125 mg may interfere with liver metabolism of other medications. Also of note is that THC will show up on drug tests, but the vast majority of tests do not screen for cannabidiol. Nonetheless, some CBD tinctures and products contain trace amounts of THC, so it’s always good to be cautious and do your research before using it if that is a concern. While some people enjoy the high from THC, many patients prefer to maintain their full mental faculties while treating their conditions. CBD may seem like a better option, but there are still many conditions where THC, or a combination of THC and CBD, are superior to CBD alone. Most forms of chronic pain, muscle spasms, poor appetite, insomnia, glaucoma and nausea are better relieved by having at least some THC content in your cannabis routine. Furthermore, some patients with severe anxiety, panic attacks, and PTSD are better treated with an indica or hybrid with a good mix of CBD and THC. Though not as powerful as THC, some patients still report that CBD helps relieve their chronic pain. Most people are familiar with the amazing benefits CBD can have for pediatric seizures like in the case of Charlotte. And while not necessarily as good for muscle spasms or multiple sclerosis, some studies have shown that CBD alone can be very effective for some Parkinson’s symptoms. The calming effects of CBD and its activity on dopamine and serotonin receptors show promise for depression and anxiety. There is research on animals that supports this idea, and many patients at Green Health Docs have reported benefits for their mental illnesses as well. In general, patients with indicated psychiatric conditions should try to use a higher ratio of CBD to THC if possible. 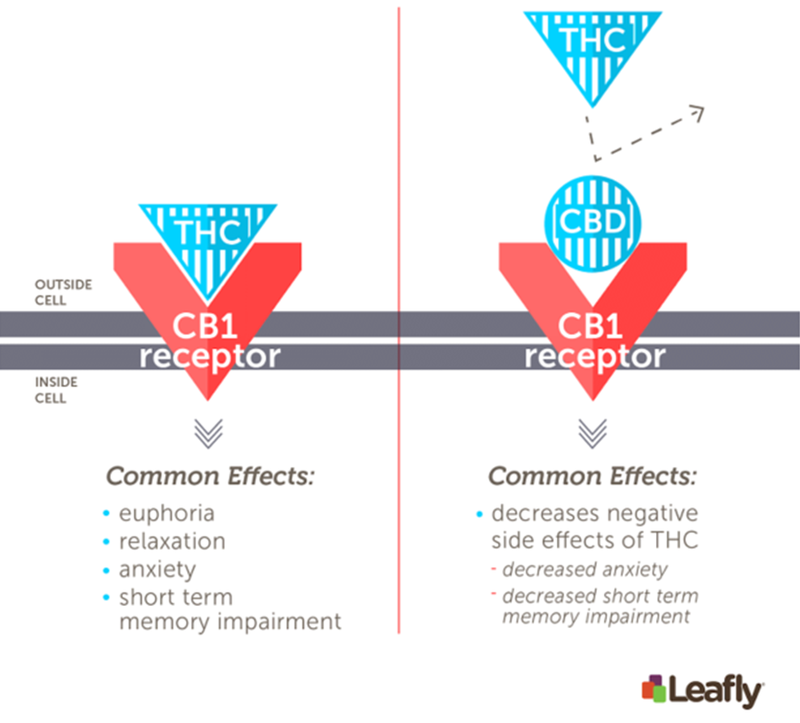 While one may seem better than the other for some conditions, the entourage effect means that it’s usually best to use both CBD and THC if possible. Their effect is enhanced when combined with the other cannabinoids and terpenes in the plant. For most ailments, it’s best to start with good 1:1 ratio and adjust/experiment with different CBD and THC amounts from there to find what works best for you. As of this blog post, Maryland’s program is still quite young and it can be difficult to find strains with high CBD: THC ratios. However, there are still quality pure CBD products available that patients can use to combine with their THC products to achieve a 1:1 ratio or higher. You can find high-quality CBD products at all 6 Green Health Docs locations. We currently stock Select brand CBD Vape Pens and Tinctures in a variety of flavors to choose from, as well as CBD Living Water. If you have any questions about these products or would like to place an order, stop in to your local clinic or call/text us at (240) 356-1000.